Platt: Villard Michel Richard Is Fit for NobilityChef Michel Richard brings nostalgic decadence back to midtown. How Out-of-Town Chefs Finally Penetrated New York’s Restaurant SceneKen Oringer, Michel Richard, and others share their strategies. Villard Michel Richard Will Open on October 10Get excited. Citronelle Chef Michel Richard Is Feeling SensitiveHis next restaurant will have a bakery on the side, too, and make its own chocolate. April Bloomfield Roasts a Pig; Danny Meyer Gets Into the Juice GamePlus, Bien Cuit expands, Toby’s Estate Coffee annexes a bit of Union Square, and more in today’s leftovers. 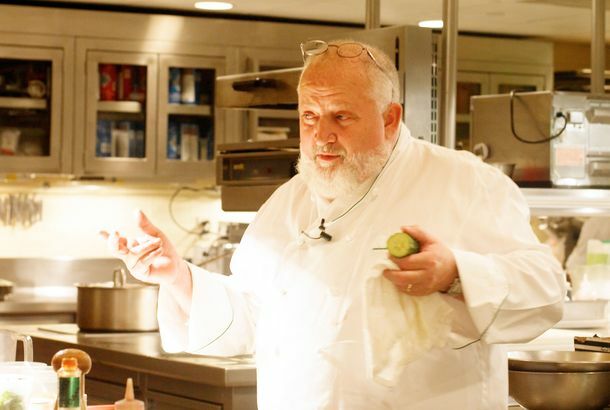 Gilt Will Close; Michel Richard Will Open Restaurant in the Palace HotelMichel Richard’s new restaurant will replace Gilt. The L.A. Epicurean Festival Returns August 26Celebrity judges for The Epicurean Cup include Michael Richard, Josie LeBalch, and Bradley Ogden. Watch Chef Jean Joho Recall Julia Child’s Extravagant 80th Birthday PartyChef Jean Joho looks back on Julia Child’s spectacular 80th birthday party. Remi Lauvand Out of Cafe Pierre, In At Downtown’s New LekaThe French chef will oversee a menu of steaks, seafood, and tapas. Michel Richard Delays NYC Debut to 2013, Looks for Downtown LocationBut the chef promises it’s still happening, mostly because he’d like his face on the cover of ‘New York’ Magazine. Atlantic City Offers Up a Taste of RevelThe Taste of Revel is offering an exhibit of foodie experiences presented in Atlantic City’s hottest new destination. Tom Colicchio Headlining Atlantic City Food and Wine FestThe festival will feature a ton of top culinary talent, but the brand-new Revel has its own competing festival planned. Michel Richard Wants to Open a Central in New York (and Other Wild Things)Like covering his wife in oysters. Pizzeria il Fico Coming To The Former Michel Richard SpaceImpromptu masking tape spells out a fall opening. A Look Into Maison Richard, Reborn on MelroseIf the flagship seemed stagnant, the breezy rebirth feels refreshing. Ruth Reichl Tweets With a Broken Foot; Robuchon and Jean-Georges Eye BeirutGourmet’s grande dame loves social networking while chefs at the top of their game look to new markets in the Middle East. Eric Ripert and Friends Cook for TibetGluttony for a good cause.